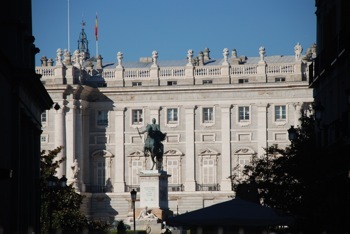 Our family had a lovely trip to Madrid from Marbella a few weeks ago and I think some of our experiences would be a bit helpful for our readers who may be thinking of a trip to Madrid. When planning a trip to Madrid from Marbella you will find that it is slightly cheaper to fly than take the train, however there is something to be said about a nice train ride (2 hrs 40 min) with the family, looking out the window, arriving just a few minutes before the train leaves, no rush, no major security to pass through, no air pressured cabins, no lines, and the convenience of arriving right smack in the middle of Madrid, so no taxis or baggage collection waits. The train station María Zambrano is located in Málaga (about 67km form Marbella), so you will need to figure out a way to get there from Marbella either by taxi about 75 euros), bus (about 6 euros), car, or hitching a ride from a friend. If you are going to Málaga with your own car there is parking available directly at the station. It is approximately 25 euros a day. You can also park your car outside of the Malaga train station with other parking services. It is easy to reserve your train tickets online. Just go to www.renfe.com and choose the link that says Welcome. This will take you through the purchase of your tickets in English. You will then be able to simply print out your boarding tickets and just have to show up at the station. Now, back to my trip. Once we arrived in Madrid we went directly to the metro, which is located just in the train station and bought tickets to the city center (Sol station) where our hotel was located. We decided to try out the new chain of boutique hotels called Room Mate. They have four hotels in Madrid and we stayed at Laura, which turned out to be the perfect location right in the middle of the city. We were able to walk everywhere from here and found several metro stops all around. The hotel is located in a renovated building and has a trendy contemporary decor. The room we stayed in had ultra high ceilings, so there was space for a loft where there was another double bed with a toilet and a small sink. It was great for our needs. The kids stayed downstairs and we had a bit of privacy upstairs. Although, this set up isn´t ideal if you have small children who could fall on the stairs. There are other rooms to choose from in the Laura hotel, so be sure to ask what you get before you reserve. We stayed five nights in Madrid, which was plenty to see all the major sights. The only downside to this trip was that we didn´t stay during any weekend, which was when all the attractions parks open and any children´s activities take place in the city. So make sure you stay the weekend if you go off-season! This won´t be a problem if you travel in high season, but we were there in October, so the Parque de Atracciones (amusement park), Parque Warner (theme park), Micropolix (indoor play city), the strawberry train, and children´s workshops in museums only open on weekends. One of the first things to do when you arrive in Madrid is to head to Plaza Mayor...the heart of Madrid where there are plenty of street performers, restaurants and souvenir shops. This is where young people gather and eat calamari sandwiches while seated on the ground. There is always something to look at and it´s a great photo op. well as a chance to watch then play against Milan. 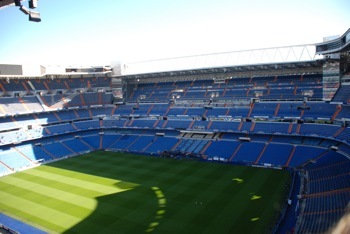 During the day the stadium is open to visitors who can explore the premises, visit the museum that displays trophies, memorabilia and photographs all relating to the history of the Real Madrid football club. There is also a chance to take a photograph with a superimposed image of your favorite player so that it looks as though you are standing next to each other. You can also look at the lockers, press room, sit on the "bench" and gaze at the pristine green grass. If you are a football fan I highly recommend that you get a hold of some tickets. Attending a Real Madrid game is a moment you won´t ever forget. We had plenty of walking time in Madrid and managed to hit a few museums. The Prado Museum is a must, but it won´t entertain the kids for long. We managed to spend a couple of hours, because my daughter really likes art, but all my son was interested in looking at was where he can find the next bench to sit on. We then headed to the Thyssen Bornemisza Museum (right across the street from the Prado), which houses modern art and kept the kids entertained for a bit longer. It´s not as big as the Prado and contemporary art is for some reason more engaging to the kids than the religious and historical art that you find at the Prado. Nevertheless, I still think the kids learn a lot by walking around the museums. You are bound to talk about Spanish history and discover some of the most famous artists. It´s painful, but good for them. The one museum that my kids really liked was the Wax Museum. Luckily, this was open during the weekdays and we were able to get it. The best figure by far was Antonio Banderas. He´s set right in the middle of the room as if he were a visitor observing the other wax figures. At first I really thought he was just a visitor. The only thing I didn´t like about the Wax Museum was the price. It´s very expensive for what it is. Other highlights of the trip was renting a row boat at the Parque del Retiro, watching street performers on Plaza Mayor, and visiting the Royal Palace. 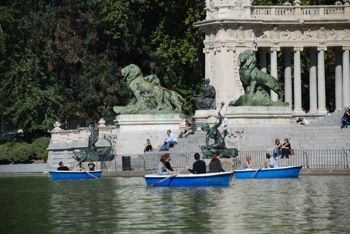 The Parque del Retiro is a huge park in the center of town that has a lake offering boats for hire, kiosks and little cafes for a quick bite or coffee, and lots of people walking around. The boat rental was reasonably priced, I believe only 5 euro for 30 minutes or so. The kids loved taking turns trying to row the boat...not so easy! The Royal Palace is worth a visit as well. It is not huge, so just as the kids start to get bored looking at the kings throne, drawing rooms and knight armor, it´s time to go. The one recommendation I have for this visit is to get there early. It is an extremely slow line, so if you see a long one, forget it and go back the next morning. 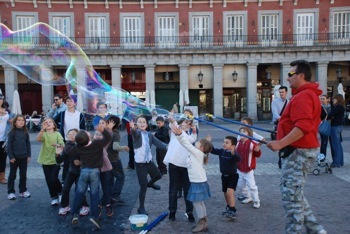 One resource that I found very useful was KidsinMadrid.com. It gives lots of information on local attractions and events that are fun for the whole family...a bit like us! If you have something to share about your trip to Madrid, please make a comment! We´d all like to hear about your experience too.